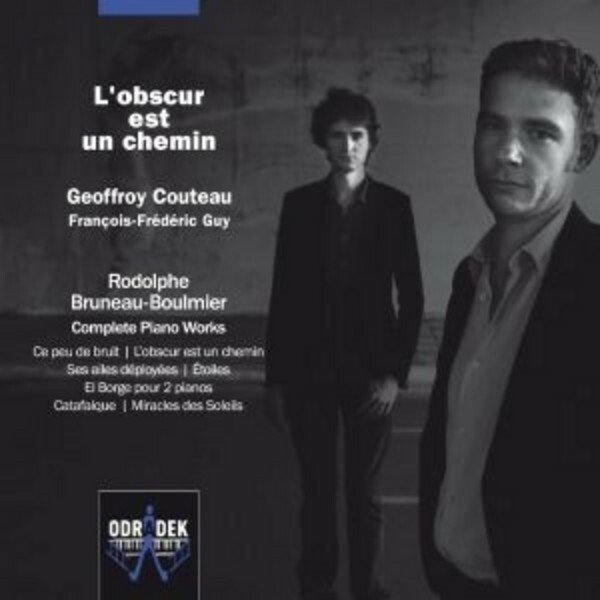 French pianist Geoffroy Couteau presents the music of Rodolphe Bruneau-Boulmier, a young and vibrant Parisian composer whose music is immediately appealing and who enchants his listeners with his immersive soundscapes. Bruneau-Boulmier’s pieces range from the meditative and serene to turbulent and occasionally even violent. Frequent references to literary themes offer openings to his ineffable and poetic imagination. Most of all, one is taken in by a pervasive sense of nostalgia. Bells, sometimes promising joy, sometimes sounding like a knell, punctuate the journey. Geoffroy Couteau, who has collaborated with the composer since 2010, offers a sensitive and intimate performance of these works, here presented for the first time on disc. He is joined by world-renowned pianist François-Frédéric Guy, who makes a guest appearance on the four-hand piece ‘El Borge’. The title of the fourth work, ‘Dark is a Way’, sets the tone and the theme of the album: it is a path which takes us from something like the sombre 'gibet' of Ravel’s ‘Gaspard’, and delivers us to, if not an absolute transcendence, at least a wise sense of calm acceptance with recurring rays of hope. Praising his debut recording dedicated to Brahms, Geoffroy Couteau was described as a “fearless” pianist by Le Monde de la Musique, which compared the young artist’s interpretation to piano giants such as Gilels, Katchen, Lupu, Kempff and Serkin. Regularly exalted in the press among his emerging generation of pianists, his last CD, devoted to Chopin and Scriabin, also garnered enthusiastic critical acclaim.